I'm always pleased to feature Memphis music here, and although Melvin Kimmons (Kim Melvin) never got a big hit its important that his contribution to the music scene of the city is recognised. His first release was the deep My Wishes on which he delivers his pleading song with some fine Otis R style "my my my" touches. It has some great chord changes and tasteful piano fills as well. 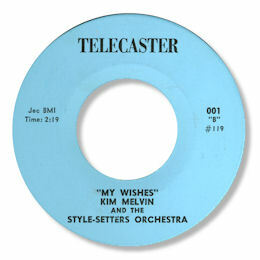 The other track of Melvin's that I want to highlight here is on his first Hi 45. "Doin' the Popcorn" has some dance fans but the slow flip is much more to my taste. 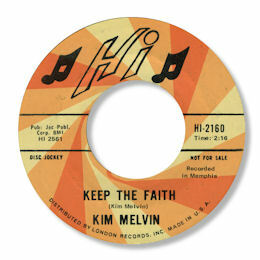 Keep The Faith is taken at a funereal pace, and that, combined with the spare instrumentation in the verses, allows Kim plenty of space to wail his own uplifting lyric. I really like the way the song switches from low and slow to power and action when the chorus comes round. 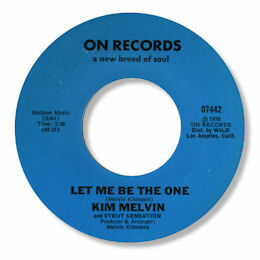 It is worth mentioning that "Let Me Be The One" is another very fine ballad offering - but perhaps a little too sweet for this page. These days Melvin is still making music and writing songs like his recent production of an interesting CD by Bertha Payne shows - long may it continue. Thanks to Patrick Biggerstaff for the Randa 45 info.